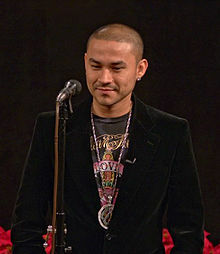 Francisco Javier Bautista, Jr. (born December 7, 1977), better known by his stage name Frankie J, is a Mexican-American singer, songwriter, rapper and former member of the musical group Kumbia Kings. Born in Mexico, he grew up in San Diego and became a freestyle artist under the stage name Frankie Boy in the late 1990s. He then went on to joined Kumbia Kings before re-embarking on a solo career. Frankie J's solo debut album, What's a Man to Do, was released in 2003, followed by more English and Spanish language albums. He received a Grammy Award nomination for his album Faith, Hope y Amor in 2013 for Best Latin Pop Album. Bautista was born in Tijuana, Mexico and raised in San Diego, California from the age of two, after his uncle brought him and his siblings to the United States. He grew up listening to both traditional Latin music as well as American urban music. He attended Southwest Senior High School in San Diego. He later began to develop more interest in singing, with the encouragement of his family. At high school age, he began participating in talent shows and performing at school functions. In 1997, Bautista signed with the now defunct Hola Recordings which at the time had only one artist signed to the label, the brainchild of dance music legend and producer Jellybean Benitez. At the time, he was a freestyle artist known as Frankie Boy and his music was released on 3 Maximum Freestyle compilations but his solo CD was shelved before release. In 1999 he became a member of the Kumbia Kings created by A.B. Quintanilla, brother of Selena. He performed under Cisko. Frankie J signed as a solo artist with Columbia Records and released his first album What's A Man To Do on May 27, 2003. His self-titled first Spanish-language album Frankie J was also released later in the same year. The album's lead single "Don't Wanna Try" peaked at #19 on the Billboard Hot 100 Singles Chart, while "Ya No Es Igual" went Top 10 on the World Latin charts. Later that year, he was featured in the Top 10 Billboard Hot 100 hit "Suga Suga" by rapper Baby Bash. His second album The One was released on March 22, 2005. It was led by the #3 Billboard Hot 100 hit "Obsession (No Es Amor)" featuring rapper Baby Bash, and followed by the Top40 singles "How To Deal" and "More Than Words". To coincide with the release of "More Than Words", the album was re-released on the DualDisc format in October. By January 2006, The One was certified platinum by the RIAA for shipping over a million copies. His second Spanish-language album Un Nuevo Dia was released on June 13, 2006, and featured the single "Pensado En Ti". Frankie's third English-language album, Priceless, was released on October 17, 2006. It debuted at #30 on the Billboard 200. The lead single "That Girl" featured Chamillionaire and Mannie Fresh and peaked at number 43 on the Billboard Hot 100. A second single, "Daddy's Little Girl", charted at number 23 on the Billboard Bubbling Under Hot 100 chart. Following his departure from Columbia Records, Frankie J released a few singles ("Pictures", "If You Were My Girlfriend", "Crush") between 2008 and 2011, as well as starting his own label, Soulsick Records. He has also written songs for other artists, most recently the number 2 hit song "Take a Chance on Me" in the United Kingdom for boyband JLS. He released his fourth English-language studio album Courage on December 7, 2011. The lead single "How Beautiful You Are" was released to digital retailers on October 24, 2011. The music video was directed by Mike Ho and premiered on YouTube on September 11, 2011. The video for the album's second single "And I Had You There" premiered on Frankie's YouTube channel on November 26, 2011. Frankie J and Baby Bash shot a video for the album's third single "That's Wussup" in December 2011 in San Diego, California. The video premiered on January 8, 2012. In 2011 he signed with Universal Music and began work on a new Spanish-language album. He released two digital singles ("Ay, Ay, Ay" and "Tienes Que Creer En Mi"/"Take a Chance on Me") in late 2012. In 2013, he released his new album, Faith, Hope y Amor on May 28, 2013. The album was nominated for the 56th annual Grammy Award under the category of Best Latin Pop Album. It was preceded by the release of the singles "No Te Quiero Ver Con Él" and "Beautiful" (featuring Pitbull). "Impossible" was also released as a single. On November 26, 2015, he premiered the single "Breakin'", with a music video (in English and Spanglish) premiering on December 14. The digital single was released on December 25, 2015. Four additional singles — "Let the Music Take Control", "I Promise You", "Riches in Heaven", and "Body Rock" — followed in 2016. He announced his next album would be titled More Than the Music. Another single "Not So Dangerous" was released on December 25, 2016. In March 2017, he scored a radio hit with "Si Una Vez (If I Once)" which was a collaboration with Play-N-Skillz, Wisin, and Leslie Grace. In June, he collaborated with Baby Bash for a new single titled "Vamonos." The following month in July, he released a new single "Lowrider" with Baby Bash, C Kan, Ozomatli & Kid Frost. On July 27, he released his new studio album titled Eleven through his own label Soulsick Musick Inc.
Frankie appeared as a celebrity guest at the 16th birthday party of Marissa Mishelle on MTV's My Super Sweet 16. In 2011, he joined the mun2 television series RPM Miami as mechanic Ramon. The series was quickly renewed for a second season. 2003 "Don't Wanna Try" 19 8 — — What's a Man to Do? ^ "Share photos and videos on Twitter". Twitpic. Retrieved August 10, 2013. ^ a b Devenish, Colin (May 29, 2003). "Frankie J. Back At School". Rolling Stone. Archived from the original on December 4, 2008. Retrieved February 1, 2008. ^ a b Kellman, Andy (2006). "Frankie J – Biography". Retrieved February 10, 2008. ^ Winters, Kelly (2006). "Frankie J. Biography". MusicianGuide.com. Retrieved February 1, 2008. ^ Kellman, Andy (2003). ""Frankie J" – Overview". Allmusic. Retrieved February 1, 2008. ^ a b c d e "Frankie J – Billboard Singles". Allmusic. 2006. Retrieved February 1, 2008. ^ Sendra, Tim (2003). ""Now, Vol. 14" – Overview". Allmusic. Retrieved February 1, 2008. ^ Kellman, Andy (2005). ""The One" – Overview". Allmusic. Retrieved February 1, 2008. ^ Kellman, Andy (2005). ""The One [DualDisc Bonus Track]" – Overview". AllMusic. Retrieved February 1, 2008. ^ "RIAA searchable database". Recording Industry Association of America. Archived from the original on June 26, 2007. Retrieved September 11, 2010. ^ "Frankie J – Billboard Albums". 2006. Retrieved February 1, 2008. ^ "Browse Albums | Discover & Download Music". eMusic. Retrieved August 10, 2013. ^ "How Beautiful You Are – Single: Frankie J.: MP3 Downloads". Amazon.com. Retrieved August 10, 2013. ^ "Frankie J (How Beautiful You Are) Official Music Video". YouTube. September 11, 2011. Retrieved August 10, 2013. ^ "Frankie J feat Baby Bash That's Wussup". YouTube. January 8, 2012. Retrieved August 10, 2013. ^ "Frankie J. Joins Jennifer Lopez, Enrique Iglesias Summer Tour After Wisin & Yandel Drop Out | Billboard". Billboard.biz. July 12, 2012. Retrieved August 10, 2013. ^ "Twitter / therealfrankieJ: #impossible RT @Express1self:". Twitter.com. Retrieved August 10, 2013. ^ therealfrankiej1 (November 26, 2015). "Frankie J "Breakin"" – via YouTube. ^ a b therealfrankiej1 (December 14, 2015). "Frankie J "Breakin" (English)" – via YouTube. ^ "Breakin' - Single by Frankie J on Apple Music". December 25, 2015. ^ "Not so Dangerous" – via Amazon. ^ PlayNSkillzVEVO (January 20, 2017). "Play-N-Skillz - Si Una Vez (If I Once)[Official Video] ft. Wisin, Frankie J, Leslie Grace" – via YouTube. ^ "Vamonos" – via Amazon. ^ "Lowrider" – via Amazon. ^ "Eleven" – via Amazon. ^ "MTV Original TV Shows, Reality TV Shows - MTV". MTV. ^ "'RPM Miami': The first biligual one-hour drama premieres in May – Zap2it". Blog.zap2it.com. April 15, 2011. Archived from the original on December 24, 2013. Retrieved August 10, 2013. ^ Thielman, Sam (May 17, 2011). "Telemundo, Mun2 amp up series". Variety. ^ a b "RIAA – Gold & Platinum – Frankie J". RIAA. Retrieved December 2, 2009. "If You Were My Girlfriend"
Noe "Gipper / El Animal" Nieto, Jr. This page was last edited on 3 March 2019, at 00:17 (UTC).